Bad Penny: London: a Ripper! 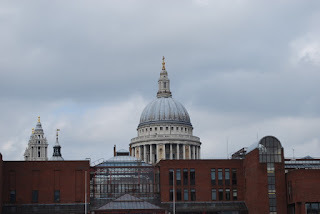 The day after we visited Cambridge, Nija and I toddled down to London, as you do, to see what we could see. The problem with London is one of too too much. There is simply too much. With only one day, one must simply decide on three or four things, see and/or do them, and call it quits. People live in London their whole lives and never see all of it. Much less learn all its history. So here was the plan. Start: Westminster Abbey. Which we did, but I don't think we took any pictures. We did, however, get to see all the famous memorials–Darwin, Dickens, Austen, Newton–and Nija was most excited to see the memorial honoring Dr. Paul Dirac, though he's buried in the exceedingly unlikely location of Tallahassee and not within the Abbey itself. The Abbey actually has this fabulous free audio tour you can take that's narrated by Jeremy Irons, which made me think 'Wow, he must be so pious'. But I suspect there wasn't any sort of test of purity to get the gig. It's Jeremy Irons, after all. Who'd say no to that? 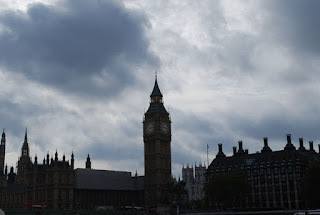 Skimming over the worn stones of Westminster gave us our first dose of Too Much: it's unbelievable how much history is literally crammed into the place. 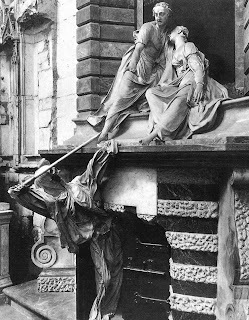 Monuments are obscured by monuments, shoved chockablock into every nook and cranny. I had to feel some kind of pity for those long-dead Brits whose memorials have had others built right in front of theirs, as if their memory was tossed aside in favour of whatever lord or lady had more recently passed. There they sit, deprived of the gaze and, by implication, prayers of the public, the eternal victims of fashion and royal caprice. Have a look: the ghastly figure of Death emerges from its cell to aim a spear at the heart of poor Lady N, as her valiant husband clutches her in protection to his breast and offers Death a defiant gesture. On seeing this, the most Metal tomb ever, I was moved to promise Nija that if she is tragically taken before me I shall erect for her a similar tomb, depicting how brave I was through it all. All in all, there must be nothing like Westminster anywhere else, with the possible exception of the Pantheon. If you're troubled by the notion of spooks, then stay away from this joint, it'll be absolutely bulging with 'em. The building's not chopped liver either. That's basically how Jeremy Irons put it, but it just sounded classier because of his accent. It's the main drag off of which Downing Street runs, where the PM lives. In this Era of Terribleness, the entrance to Downing St is gated off and heavily-guarded. We weren't sure whether David Cameron was around at the time, because his father had died in France a few days previous. However, plenty of tourists had their noses in the gate and were snapping photos madly, expecting a glimpse, no doubt, of Tony Bliar (sic). They were sure to be disappointed, but not to worry, He Who Shall Not Be Named was visible around every turn anyway, leering from the cover of his new book. Piles of them were in every bookstore window; I imagine they were heaped up like that so they'd be easy to set on fire. The respectable tourist/military/civil servant whirl that is Whitehall feeds into the thumping heart of Westminster that is Trafalgar like an...um...oh, what's a good metaphor here? Anyway, Trafalgar Square must be the original home of Too Much: too much tourism, too much pigeon-feeding, too much column! That last one refers to the 150-ft pedestal topped with a masculine-looking Lord Admiral Horatio Nelson, hero of–you guessed it–Trafalgar, where the French and Spanish naval forces suffered a thorough defeat in 1805 during the War of the Third Coalition (as if I needed to add that). This would've been great for Nelson's career if he hadn't been shot and killed during the battle. Still, he was later made Prime Minister, leading to the famous Crisis of Parliamentary Decomposition of 1806. 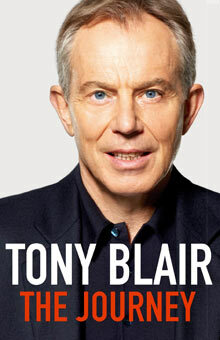 That might be false, though, as I read it in Tony Blair's book. Trafalgar Square is the home of London's National Gallery. In front of that neoclassical eyesore stand two pillars: one is festooned with a statue of King George IV, and the other, the so-called 'Fourth Plinth', is reserved for temporary installations. 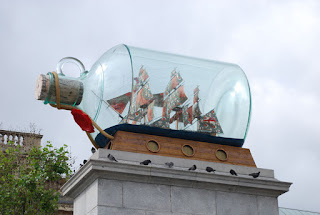 At the moment, the Fourth Plinth holds a giant ship-in-a-bottle conjured up by none other than Yinka Shonibare, who must qualify as the World's Most Badass Living Artist. Too Much! 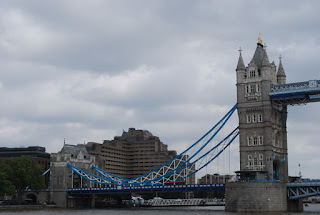 Tower Bridge, while famous, is often mistaken for London Bridge, which is the next bridge upriver and is actually pretty unremarkable, as it was built in the 1970s and lord knows how that decade went. The original London Bridge was dismantled, bought by chainsaw tycoon and oil magnate Robert McCulloch, and moved to Arizona, where it was rebuilt over a canal leading from Lake Havasu. This comes as a surprise to most people, naturally, since it's not common knowledge that there are lakes in Arizona. 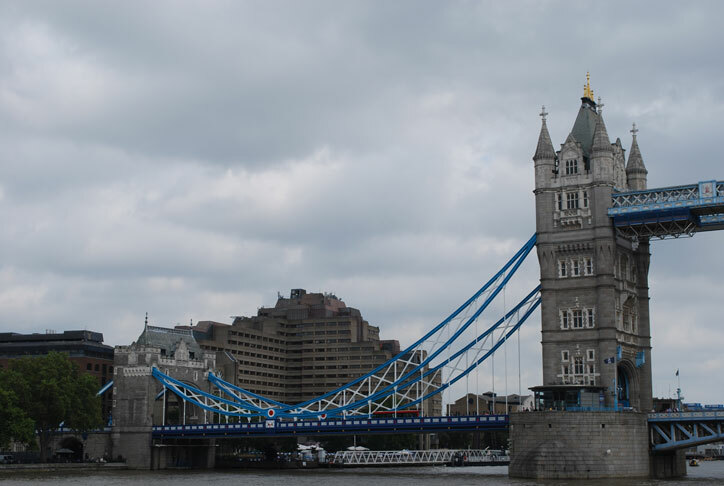 Debarking from the ferry at Tower Bridge, we walked up the hill past the Tower of London in the direction of a section of town recommended to us by my second cousin Becky: Brick Lane. On finding the street we were delighted and confused to realise that we'd been sent to the Bangladeshi/Bengali neighbourhood. Happy that we were seen as sophisticated internationalists, we still had a hard time understanding Becky's description of Brick Lane as being full of cute coffeeshops and second-hand stores. That's probably not how we would've described it, anyway. Just as Nija got Becky on the phone for a clearing-up, the scenery changed. Though there were just as many mustaches to be seen on this part of the strip, the pants were suddenly much tighter. Signs were written in Hipster, not in Bengali as before. Becky's description of Brick Lane was confirmed as we passed charismatic cafes and bagel shops, and wandered into Spitalfields Market. We had a couple hours to kill before the Main Event on our schedule, and it was easy in this part of town. As the sun got low in the sky, we rushed to polish off bowls of noodles to fuel up for our evening adventure: the legendary Jack the Ripper walking tour of the East End! Nija and my Mom did this when they visited four years ago and I haven't heard the end of it since. Nija was clearly keen to do it again, and I took the recommendation. These tours are just one of the many offerings of London Walks, considered one of the best walking tour companies in the world. And I can see why! The price is cheap, especially for that town, and the talent is top-notch. As we strode through dark alleys into loading bays and empty courtyards in this still-gritty section of town, our guide Shaughan appeared to reach into the depths of his spirit to give us a rollicking show. He took us through the events of 1888, when London was held in thrall to the terrifying murders of prostitutes in Whitechapel. Shaughan so deftly took on the voices and behaviour of the characters in his tale that he actually gave me goosebumps at several points. For an hour and a half our big group of tourists raced through backstreets we wouldn't have dared set foot in otherwise, tracking Jack as he slashed his way through the night. You could feel the history seeping from the darkened walls, even though Whitechapel has certainly changed since then. It was history mixed with politics and social commentary presented as riveting theatre, all packaged in a brisk walk. I can't imagine a better way to end a day in Londontown. Tired and satisfied, we considered whether we should hit the bar or get the train back to Hertford for a nightcap with Ann and Geoff. We opted for the latter. A London bar on a Friday night...it just seemed like much Too Much.